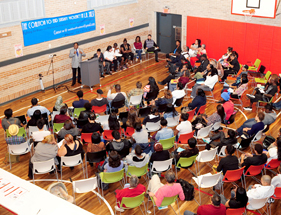 Close to 150 people from different areas of Los Angeles came to the 28th Street YMCA on Mar. 14 to strategize on ways to end the epidemic of violence occurring in the Los Angeles County Jail System. The Coalition to End Sheriff Violence in the L.A. County Jails (C2ESV), which organized the townhall meeting, says that only an independent and elected civilian review board that would oversee the jail and have the power to investigate complaints and discipline sheriff’s deputies will bring transparency and accountability to management of the L.A County Jails. The group was supported in their efforts by Los Angeles County Supervisor Mark Ridley-Thomas who told them that the jail administration can not police itself and that the Board of Supervisors is unable to do it either. “Its just not practical,” said the 2nd District Supervisor. Current Sheriff Lee Baca and former undersheriff Paul Tanaka have been in the line of fire over the last several months for findings from the Citizen’s Commission on Jail Violence which was created in October of 2011 to “conduct a review of the nature, depth and cause of the problem of inappropriate deputy use of force in the jails, and to recommend corrective action as necessary,” according to the Los Angeles County government website. In issuing their findings in September of 2012, the Commission made 64 recommendations, 60 of which dealt specifically with the management of the jails. Cullors-Brignac’s brother was incarcerated in the L.A. County Jail approximately 13 years ago, she said. Cullors-Brignac alleges that his assault by sheriff’s deputies left him with a form of Post Traumatic Stress Disorder that continues to this day. “He hasn’t been the same since, she said. 26-year old Jermond Davis “testified” at the townhall that he was a victim of jail violence during a six-month stay in 2006. Davis says he was in the jail as a result of doing “something stupid when he was a kid,” two years prior. “I still have handcuff marks to this day from where the cuffs were on me too tight while they were beating,” Davis added. Baruti says he was also a victim of sheriff’s deputy violence in the L.A. County Jail in the early 1980s. He is now an organizer with the group All of Us or None, which is made up of formerly incarcerated and convicted persons, that fights for the restoration of their civil and human rights. On Mar. 19, Sheriff Baca made a presentation to the Board of Super­visors calling for close to $1 billion dollars to replace the Men’s Central Jail, which recently turned 50 years of age, and to refurbish other existing facilities in other parts of Los Angeles County. The Board postponed a decision on the proposal, opting to wait until they hear back from an independent consultant who will produce a study on the exact needs of the county’s incarceration system. The Board has not yet taken up the issue of civilian oversight but as evidenced by his appearance at the townhall meeting, Chairman Mark Ridley-Thomas will be the most likely cheerleader for it when it does come before the body.